Baking and Mistaking: Hungry For More? On a few occasions I've ventured away from the backbones of this sight: sugar and butter. That's right, sometimes I don't eat cake for dinner. Sometimes I cook real food. So if you're hungry for more than tarts, pies, muffins, cookies and galettes, what are you doing here? 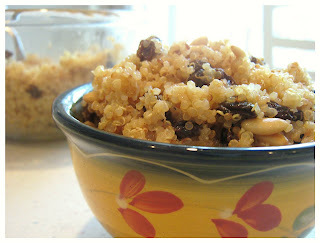 Just kidding - if you are intrigued by things like potato leek soup, quinoa with toasted pine nuts and raisins (pictured), and stuffed acorn squash...then you should check out my new recipe column over at the Jewish Week: Nosh Pit. Check back in once a week, I may have a few more things up my sleeve...like stuffed shells with homemade tomato sauce, apricot and shallot chicken and boozy sweet potatoes. P.S. If you follow me on twitter, I'll let you know when I have a new recipe up!